After I wrote this post I read rules by myself and found out, that we made many mistakes. 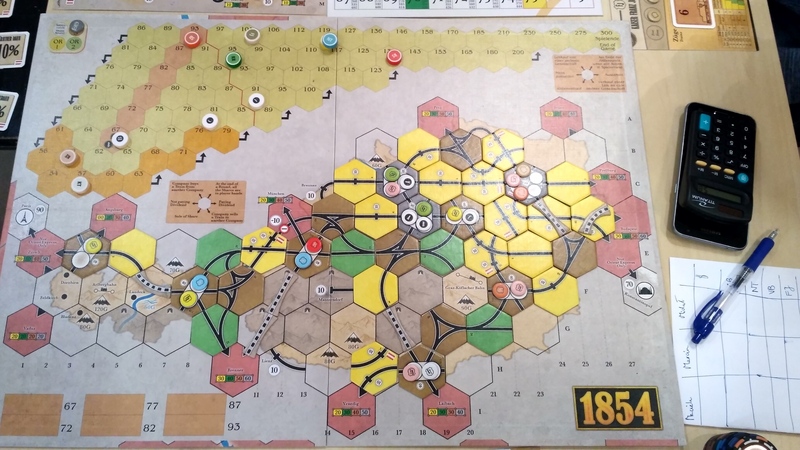 18xx games are complex, but that was a big fail… I didn’t read rules before play, because Marcin prepared short rules summary, and I was thinking that it was good. But it wasn’t. 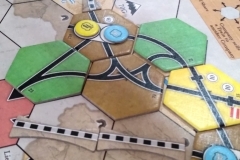 One of the ommited rule was: “Yellow tiles with two small towns may be upgraded to a green tile with a city (tiles #14, #15, and #619).”… With this rule my SD company wouldn’t be as weak as it was. So keep in mind, that we made such a big mistake, but I hope that you still will enjoy this article. Me, Marcin (Magole) and Maciek. 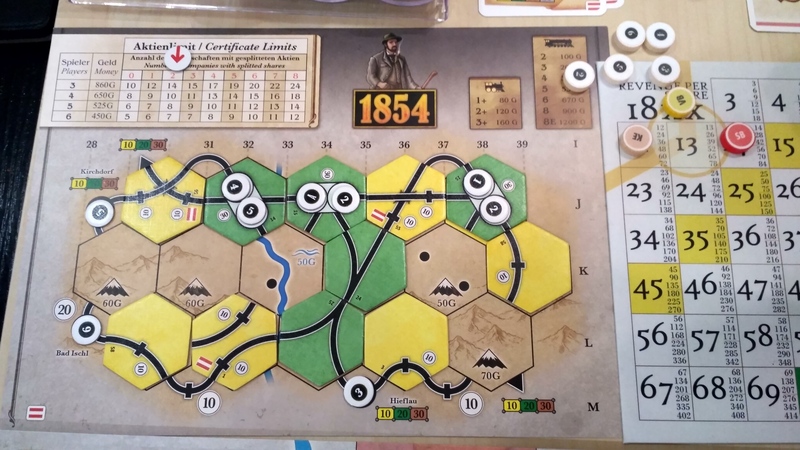 This time Michał from Olkusz was on the vacation, and Jacek, who always played with us 18xx games in Mysłowice, was playing different title. The start was strange, because only Maciek wants to buy private companies at the begginig. Of course me and Marcin also bought, but only 1 private. Maciek took first, Marcin second and I bought that one, which gave you +10 to Graz. 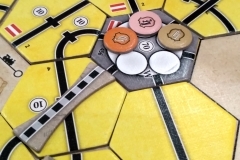 After that Maciek bought local railway 1, I put my bid on last company (which gives you 20% of SB) and Marcin passed. Then nobody wanted to bought anything so our privates pay out. And they did that few times. In meantime I put my bid on last but one private, Maciek put bod on last one. Then Marcin bought local “3”, I bought “4”. Marcin “5”, me “6” and then I bought last but one private and I was competing with Maciek to bought last one. 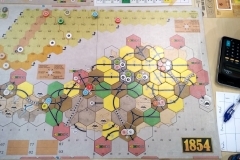 I won that, so after first stage I controlled 3 private companies with income 60, and 2 local railways. To be honest I wasn’t sure that they are good, because Marcin said that in his first play in 1854 this companies are weak. 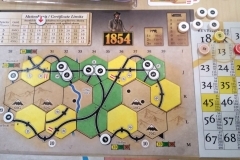 He and Maciek was playing 1854 for the second time, for me that was first play. But let’s go to this litte map for local railways. 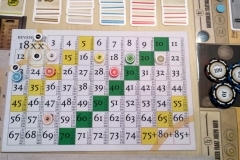 At first you might be thinking that this is some kind of mini-game which is only for fun, but when I was thinking about our play next day, I realised, that there are so many opporutnities to do a little money-maker company. 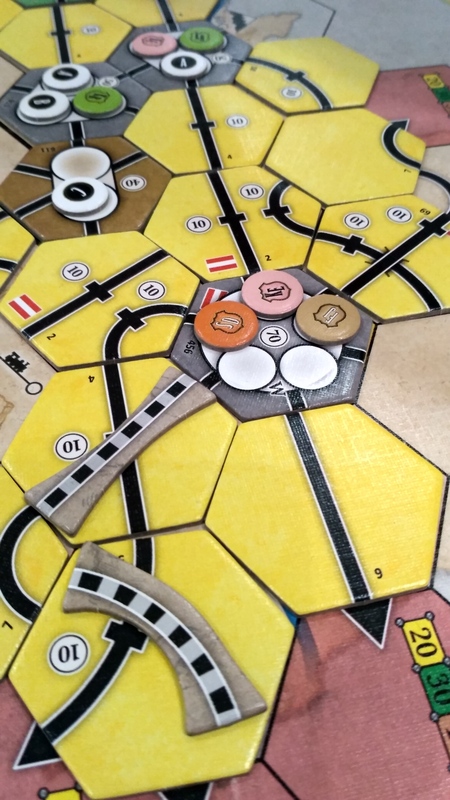 Since Maciek controlled local “1” and “2” then he could build 2 tracks for his companies, and that’s why he made really good income with them. His companies were so good and he was able to bought train “4” for localbahn when he was forced to merge his local companies. We (me and Marcin) were not so lucky with local’s and we merged them just in phase “5” because they didn’t made good income on minimap. And what was happend on big map? I run SD, but with placing that tile numer 2, I ruined all good connections for this company. Marcin ran KT but he did only connections between two red off-board areas. Maciek did better with his KE, because he prepared tracks to the west and in few SRs later he was able to ran KR. In this moment I finally realised that there is not only no chance to stop Marcin with his win, but I have to do more to ended at second place. 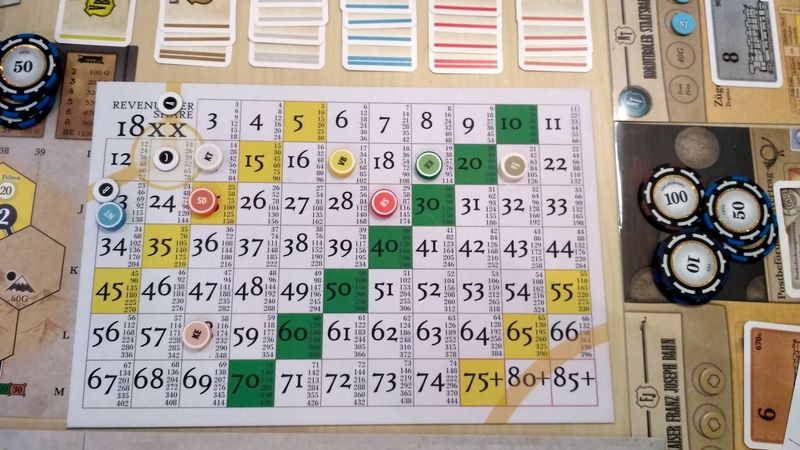 I bought train “8” to SD and at the end of the game I was able to generate 250 income… Only this and investing in companies controlled by Marcin gave me second place. Definetly I have to look closer on the map and tiles, no more stupid tracks laying! That was nicely spended 6 hours of playing. The map isn’t big, and there are some restrictions with tunnel laying, and that’s how Marcin blocked half of the map. Idea with split shares is great and there are many ways how to use it. Maybe you should keep your company in low share price just to generate money for trains? I lost this game to Marcin, but after that I don’t feel sad. We were talking about our play for more than half an hour to figure out what was the crucial. 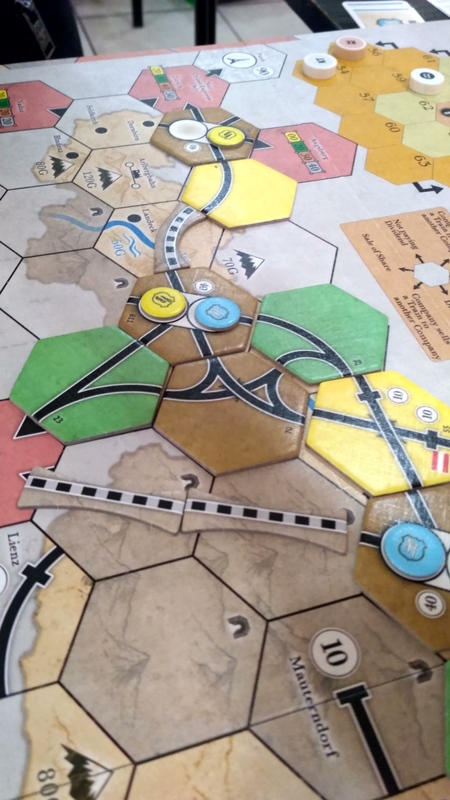 Today, we know that we have to play one more time, because we didn’t use rule which allows upgrading 2-towns-tiles to bigger city. With this knowledge I guess that my SD wasn’t as badly located as I did with laying track 2.